How can I manually import tracking information into Unify Desktop? Importing tracking information is useful if your orders are shipped using a Drop Shipper or if you are using a shipping software that Unify Desktop does not integrate with. Once you import the information, Unify Desktop will update relevant orders in the Inbox tab of the dashboard and mark them as shipped. 1. The first and most important step is to ensure that you have a CSV / XLS file that looks like the Image below, and has minimum 6 columns. Columns in bold, i.e. Order Number, Ship date and Tracking Info are mandatory for the import process to work. Please note that It is not necessary that the column names remain the same, but the values that the columns contain should be Order Number, Ship date and Tracking Info so that they can be mapped to the Unify Desktop Field names later. 2. 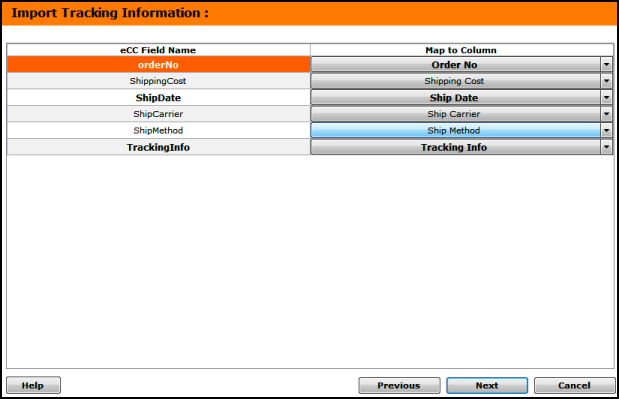 To import your CSV / XLSX file, go to Shipping >> Import Tracking information. This opens up a screen that allows you to browse for a tracking CSV / XLSX or such file that has shipping and tracking information for the orders in Unify Desktop. 3. Once the file is imported into Unify Desktop, click on Import Orders to import the information from the file into Unify Desktop. Should you have any problems, you can click on change settings and follow the full featured wizard to import your information. The full featured wizard also allows you to map columns from your CSV with columns required by Unify Desktop. 1. If you wish to change any settings related to the import tracking info wizard, click on the change settings button. 3. Click 'Browse' and select the CSV / XLS file that you would like to import and click next. 4. The screen that follows allows you to map columns from the CSV / XLS to the Unify Desktop Field Names. 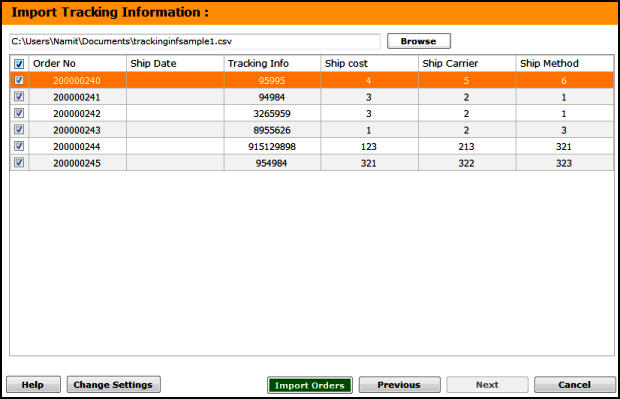 As mentioned, Order Number, Ship Date and Tracking info are mandatory columns. Click next to import the mappings and then click ok.
5. 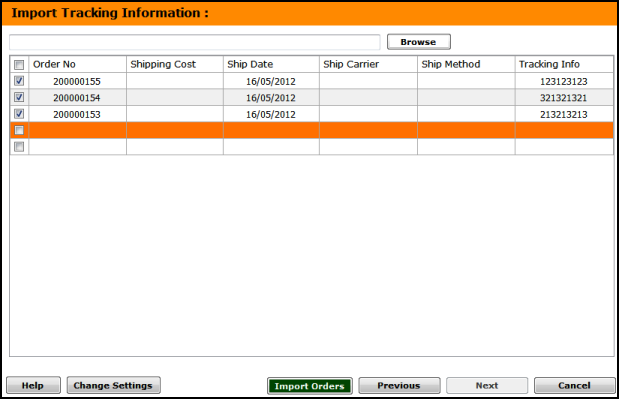 Once you see the screen below, select the info you want to import and click import orders.